The first round of the SHS Allium Ltd Fishtoft Cup got underway this weekend with Wyberton Reserves securing a big 7-1 win away at Billinghay Athletic. Spilsby Town put six past Coningsby, whilst Old Doningtonians could not find their feet as Swineshead Institute put six past the home side. Benington held Boston College at home as it finished 2-2 at full time, however the College managed to secure their place in round two as they won 3-1 on penalties. Pointon edged a close 4-3 win at Old Leake, their goals coming from Sean Taylor, Thomas Buckberry, Jordan Parker and Dom Kew. Kirton Town are out in the first round as Railway Athletic put four past the travellers, whilst Woodhall Spa United won 2-1 against Friskney. Skegness Town Reserves finished with a strong 7-2 victory against Fishtoft. Just the one game was played in the Workforce Unlimited Premier Division, which saw neither Ruskington Rovers nor Fulbeck find a break through as their game finished at 0-0. In Division One, FC Hammers travelled to Park United and, despite two Park goals from Neil Allen and Jimmy Harris, Hammers came out with all the points in a 5-2 victory. Freiston found their first three points of the season in a 6-2 success at Swineshead Reserves, whilst Horncastle Town Reserves earned a 3-2 win against Fosdyke. Boston Athletic keep up their unbeaten run in Division Two, winning 2-1 against Holbeach Bank, taking them to four straight league wins. Eagle United also keep up their good run after putting eight past Coningsby Reserves. Boston International are yet to find a win in five league games. They tasted another defeat as JFC Seniors secured a strong 6-2 victory. Railway Athletic Reserves won 3-1 at Splading Harriers and FC Wrangle took their first win of the season in a good 4-1 win against Colsteworth. 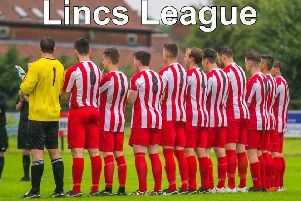 Caythorpe and Skegness Town A found three apiece but no winners in sight. Bull Athletic sit at the top of Division Three after a big 9-1 win at Digby. Northgate Olympic ran away with it at Mareham as they put 10 past the home side. Boston College Reserves won 3-1 at Woodhall Spa Reserves, whilst Wyberton A found their first win of the season as they put four past Park United Reserves. Ruskington Rvrs 0 Fulbeck United 0. Workforce Unlimited Division One: Horncastle Town Res 3 Fosdyke 2, Park Utd 2 FC Hammers 5, Swineshead Res 2 Freiston 6. Workforce Unlimited Division Two: Boston Athletic 2 Holbeach Bank 1, Caythorpe 3 Skegness Town A 3, Eagle United 8 Coningsby Res 0, FC Wrangle 4 Colsterworth 1, JFC Seniors 6 Boston International 2, Spalding Harriers 1 Railway Res 3. Workforce Unlimited Division Three: Digby 1 Bull Athletic 9, Fosdyke Reserves v Old Dons Res - postponed, Mareham Utd 0 Northgate Olympic 10, Woodhall Res 1 College Res 3, Wyberton A 4 Park Utd Res 0. SHS Allium Fishtoft Cup, round one: Billinghay Athletic 1 Wyberton Res 7, Boston College 2 Benington 2 (College won 3-1 on pens), Coningsby 0 Spilsby Town 6, Old Don 1 Swineshead Institute 6, Old Leake 3 Pointon 4, Railway Athletic 4 Kirton Town 0, Skegness Town Res 7 Fishtoft 2, Woodhall Spa Utd 2 Friskney 1.